Malaysia’s property market is set to enter tougher months ahead, as the negative sentiment from global real estate market hits the nation’s shore. That is the overall view shared by industry players at the recently-held Rahim & Co seminar 2009. The one-day event covered a wide range of topics on the domestic economy and property market and included prominent speakers such as economists, former government servants, valuers and property consultants. Malaysian Institute of Economic Research (MIER) projects Malaysia will have 50% chance of full-year recession this year and is quite certain that the country will dip into technical recession in the first half of this year. MIER executive director Prof Datuk Mohamed Ariff Abdul Kareem expects the domestic economy to return to normalcy only in two to five years. He opines the world may witness further economy deterioration, as he sees more companies will collapse within six months times. He says that typically the property market is the first to feel the strain during an economic crisis and, unfortunately, the last to recover. As an open economy, Malaysia is not spared from the global financial crisis as well as property market meltdown. Since late last year, the domestic property market has started to show signs of weakening. Rahim & Co executive chairman Datuk Abdul Rahim Rahman says Kuala Lumpur City Centre’s (KLCC) high-end condominium is heading towards a 15%-20% price depreciation in two to three months. He says buyers are looking for more realistic pricing, reflecting the current conditions. In a worst-case scenario, he is projecting up to 30% drop in prices over that period. 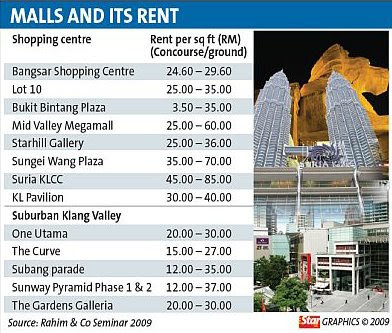 Average price stands at RM1,500 per sq ft in KLCC presently. In other suburbs such as Bangsar, Damansara Heights and Cheras, he predicts a 10%-15% decline. Abdul Rahim tells StarBizWeek that rental of office space in KL should not be affected at least until the end of the year but he expects prices to come down after that. “If I am in the KLCC area, I want to save a little bit of money due to the downturn. I will downgrade my office, which I will reduce from RM8 to RM6 per sq ft. So, the KLCC landlord may have no choice but to reduce by 10% to 15% (to prevent the tenant moving out). But at this time, the rental rates are maintained,” he elaborates. 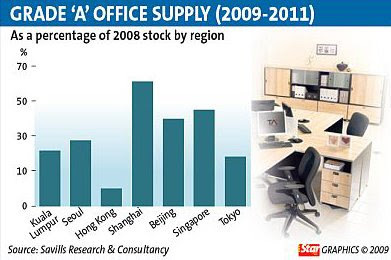 There will be additional 8 million sq ft of office floor in KL by 2011 or 2012. Currently, the rental rates at KLCC and the KL vicinity are between RM6 and RM8 per sq ft and between RM4 and RM6 per sq ft respectively. On the retail sector, he says Malaysia is fortunate as there are not many retail centres being planned now or coming on stream. Thus, he says retail space is mostly occupied and rental rates have been maintained. However, he points out that the segment may witness a downtrend should the unemployment rate rise. Abdul Rahim says the commercial sector is least affected now, but in the long-term, affordable housing will be the least affected by the crisis, as people still need a house to stay in. Ho Chin Soon Research Sdn Bhd managing director Ho Chin Soon advises developers not to be unduly concerned about the external factors such as interest rates and global economy but instead concentrate on their branding. No matter what the economic cycle is, there are always buyers out there, he says, citing SP Setia Bhd’s recent RM300mil sales which it had chalked up in less than two months largely owing to its financing package promotion. He concurs with most of the consultants that KLCC high-end properties are seeing a correction now. “I saw this notice on the sale of a KLCC Marc Residence – “Financial crisis, desperate seller, asking price RM960 per sq ft”, but assuming he sold at RM900 or RM850 per sq ft, he still makes profits if he had bought from the developer for RM650 per sq ft. But the ones who bought at RM1,000 per sq ft and sold at RM800 per sq ft, will be making losses,” he says. However, he notes that the number of such transactions are few and far between and that the real picture will be revealed by the National Properties Information Centre in a report scheduled to be released in April this year. The United States’ economy is the backbone of world economic stability. As such, consumer confidence of the property market will only be restored once the US stabilises. “The US is in recession but once it stabilises, it will be good news,” says Ho. Meanwhile, Real Estate and Housing Developers’ Association Malaysia president Datuk Ng Seing Liong concurs that the current world economic crisis will certainly affect the property market. He expects the sector to trend downwards by 5% to 10% this year. “There will be definitely a drop in terms of demand and prices but the situation in the country is still under control,” he tells StarBizWeek. Ng says this is a good time to buy houses as property is always a good investment. “We hope that the next stimulus package will bring some goodies to this sector to spur sales and generate economic growth,” he says. International Real Estate Federation Asia Pacific executive director Yu Kee Su says generally, the prospects of the property market is not so bright but compared to other countries, it is holding steady in terms of pricing. “Certain areas like Bandar Utama for example is still stable and there has been no drop in prices,” he says. He feels many developers will scale down their launches as he expects the slowdown to last up until 2010. CYBERJAYA, the information and communications technology city once regarded as an out-sourcing hub, is fast emerging as a hub for data centre and disastrous recovery in the Asia Pacific region. Some of the multinational corporations that have already set up data centres in the area are HSBC, DHL and Dell. Cyberjaya, launched back in 1997, has 4.3 million sq ft of office space as of last year, up from just 2.6 million sq ft in 2006. Another one million sq ft of office space for ICT companies and data centre is expected to be ready this year which has been fully booked. Cyberjaya’s master developer, Setia Haruman Sdn Bhd’s chief operating officer Lao Chok Keang attributes the achievement to a combination of factors – reliable and high-speed connectivity of up to 10 gigabytes per second (which meets ICT companies’ requirement) and dual source from Tenaga Nasional Bhd’s (TNB) supply and an uptime of power supply of up to 99% (near uninterrupted power supply). Over and above that, it also has standby generation sets. In addition, Lao points out that these top notch facilities are available at very competitive pricing, compared with double the cost in Singapore. Whilst the world is grappling with an economic crisis, Lao says the city has yet to feel the pinch as investors, MNCs and government agencies are still flocking to Cyberjaya. “Even after Lehman Brothers’ went into bankruptcy last September, seven local companies and MNCs announced their plans to set up offices in Cyberjaya. 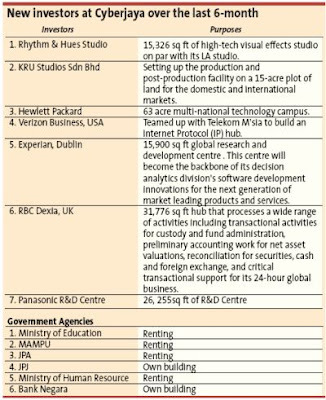 They include the Los Angeles-based award winning visual effects company Rhythm and Hues Studio, KRU Studios Sdn Bhd, Hewlett Packard, Verizon Communication Inc unit Verizon Business, Dublin-based Experian, British-based RBC Dexia and Panasonic,” Lao says. However one deal failed to go through; the company came close to sealing a 15-acre land deal with US insurance giant, AIG for its data centre and share services centre before it went into trouble last year. “Besides US and Europe, a lot of companies in Singapore and Hong Kong are relocating to Cyberjaya. At this moment, we are facing some backlog as a lot of companies are looking for huge space of over 30,000 sq ft but we can’t supply that. They have to wait for about a year for someone to buy the land and build for them,” he says, adding however that smaller space of about 1,000 sq ft is still available. But that’s a good problem. Lao is not too worried about the drop in property value in Cyberjaya amid weak market sentiments as Setia Haruman is the sole supplier of land totalling some 7,130 acres. The Government acquired the land more than 10 years ago and through the government-linked company, Cyberview Sdn Bhd has assigned all the land rights to Setia Haruman under a development agreement signed in 1999. In due time, Setia Haruman will have to reimburse to the Government the land cost that has been paid by Cyberview, which amount to over RM1bil. Setia Haruman has sold about 1,138 acres of land to-date. He says over the last 10 years, Setia Haruman has adjusted upwards its selling price by around 5% annnually. In the last three years, the company has sold about RM500mil worth of land to investors each year to be developed for lease or sale purposes. Major purchasers include Cyberview, EMKAY Group, Prima Properties Group, UEM Land Bhd, Ascendas of Singapore, Glomac Bhd, Malaysia Road Transport Department (JPJ), Bank Negara, Bernama and Volunteers of Malaysian People (Rela Corps). In recent months, it sold about RM200mil worth of land, including to UEM Land (98 acres for RM102.5mil), EMKAY (25 acres for RM52.3mil) and Rela Corps (9 acres for RM23.5mil). As such, Lao is confident that Setia Haruman will be able to maintain its revenue and profitability this year. “We expect Cyberjaya to be fully opened up in 10 years; but this does not mean it will be fully developed by them, as the city will still have pockets of land available for further development, such as in Shah Alam,” he says. The ultimate plan is to promote Cyberjaya as a complete integrated city – a place for people to live, study, work and play. Located about 20 minutes drive from Kuala Lumpur, it is free from the much-dreaded traffic jam and has an attractive environment. He says some senior executives from Kuala Lumpur have bought bungalow lots in Cyberjaya and the next step would be to convince them to move their corporate headquarters to the city. “They have chosen Cyberjaya as their residence. So, there’s no reason why we cannot attract corporate headquarters here. Over the next five years, we will actively promote Cyberjaya as a place for headquarters,” he says. Setia Haruman is not the only promoter of Cyberjaya. Government agencies such as Small and Medium Industries Development Corporation (Smidec) and Malaysia’s embassies worldwide are also doing their part. Others such as Cyberjaya’s anchor investors or long-term developers such as Quill Group of Companies and Prima Properties Management Sdn Bhd, which have also helped draw reputable MNCs and organisations such as DHL, BMW, HSBC, IBM, CapitaLand and the World Health Organisation in as tenants. Lao says a lot of large companies opt for Cyberjaya because of its ready infrastructure and talent pool. “It is easy to recruit staff here, as we have two universities – Multimedia University and Limkokwing University of Creative Technology – producing a lot of information technology graduates and creative people. And that is why KRU Studios, and Rhythm and Hues Studio have set up shop here,” he adds. Currently, there are about 36,000 workers in Cyberjaya and Lao hopes to double the working population every five years. “This year, we plan to spend about RM210mil in development expenditure, of which RM150mil will be for infrastructure such as roads and drainage system, water reservoir, water treatment plant and opening up of new land. “Another RM60mil will be used for construction of CBD Perdana 2 this year – a commercial project comprising 32 retail outlets and 92 corporate office suites, with a gross development value of RM210mil,” he says. Confidence is certainly in short supply in these times of gloom but it is what is needed if the country is to get out from the rut of the spiralling global financial quagmire. During unprecedented crisis times like these, a strong leadership is paramount to make the most of the situation and ensure confidence returns to the people and businesses as it is the foundation for an economic recovery. The second stimulus package or mini-budget to be announced on Tuesday (March 10) hopefully have all the right ingredients, including measures such as tax rebates and other direct incentives for Malaysians, to instil confidence in them and businessmen in order to arrest the slide in local demand and the economy. While most countries have already been submerged by the US-led financial tsunami, Malaysia can still count on its many resources – resilient, prudent and hardworking Malaysians; talented human resources; world-class infrastructure and vast natural resources, to steer the ship (hopefully safely) across the stormy waters of these highly globalised world we are in today. Nevertheless, the signs that the country is also being gradually sucked into the widening global crisis are already showing and a recession cannot be discounted. Instead of being alarmed or worse, to be in denial of such a possibility, it is best to face this reality with a high level of preparedness by harnessing all the strengths and resources at our disposal. There is certainly a dire need for more enabling government policies that will complement the initiatives of the private entrepreneurs and businesses to ensure the country’s economy will not succumb to a long and gruelling hard landing like what many other countries are now in. Given the magnitude of the damages wrecked by the global financial crisis since it unfolded in the middle of last year, the country’s leaders, at both the Federal and state levels, should by now have realised the fragility of Malaysia’s economy and have introduced more flexible and business-friendly measures aimed at raising the country’s competitiveness in the various industry sectors. There is much to be done to ensure Malaysia is fully prepared to face the onslaught of the full scale of the global crisis, which is expected to go into next year. A speedy, efficient and transparent implementation and disbursement of the funds under the two stimulus packages are most critical to ensure these measures work to arrest a widespread decline in the economy. In the case of the property sector, property sales has almost ground to a halt while new project launches have plummeted by more than 50% in the last two quarters of last year compared with the same period in 2007. This year, more projects are expected to be deferred as the economy worsens. Industry players are finding it hard to surf through these current difficult times and their woes are further amplified by the strict imposition of various government policies, such as the bumiputera housing policy. Given the rising number of unsold bumiputra units, the policy has resulted in increased financial burden for developers to bear the high holding cost, which inadvertently is passed on to other future buyers. The bumiputera quota has long been a requirement in the local housing scene. Developers have to reserve 30% of available units in a housing scheme for a period of six months for purchase by bumiputeras at a discount of 5%-15%. As land is a state matter, regulations differ in the various states. Although in most states, the bumiputera quota is set at 30%, in Johor, it is 40%, while in some suburbs such as Shah Alam in Selangor, it goes as high as 70%. Although the general practice is that developers can apply to the state government for permission to release unsold bumiputera units after six months or upon reaching 50% of a project’s construction, the various states have imposed their own conditions for such release. Some state governments introduced heavy monetary penalty or levy before granting the release of these unsold units. Johor, Selangor and the Kuala Lumpur City Hall came out with a levy system where an amount equivalent to the discount given to bumiputera buyers must be paid to a fund in exchange for the early release of these unsold bumiputera units. Industry players lamented this latest ruling as an enormous liability to them, especially in Johor where the bumiputera price discount is as high as 15%. Given the need for more flexible and business-friendly environment to ride out the rough economic conditions, it will be most timely for the government to meet the request of the Real Estate and Housing Developers’ Association (Rehda) for a review of the bumiputera housing policy in the current socio-economic context. Rehda has advocated firmer guidelines for a more consistent implementation of the bumiputera quota policy and its release mechanism. Among the proposed initiatives are to cap the bumiputera quota at 30%, have an automatic release of unsold bumiputera units after six months or upon reaching 50% of a project’s construction, whichever is faster, and to do away with the payment of any levy or penalty to any authorities as a result of the quota units not been taken up by the target group. Having policies that are in tune with the needs of the times is certainly one of the ways to smoothen out an otherwise rough road ahead for industry players and instil confidence back in the people. ·Deputy news editor Angie Ng has faith that by coming together as one nation, Malaysians have what it takes to ride out the crisis and emerge stronger. LONDON-BASED Berkeley Homes is targeting investors in Malaysia, Singapore and Hong Kong for the sale of its projects in central London. The high-rise properties comprising 292 apartments are collectively known as City Quarters. “These are 125-year leasehold properties,” Berkeley group managing director Piers Clanford tells StarBizWeek. In the past two months, the London property market has attracted much attention from overseas investors, according to Clanford. “This is because property prices have dropped between 15% and 20% since 2007. The interest rate for housing loan has also come down to 0.5% while the rental yield is about 5% annually. “Furthermore, the pound has weakened by about 25% compared with a year ago,” he says. So far, eight Malaysian investors have paid deposits for the properties in City Quarters, Clanford says, adding that Berkeley has sold about 70% of the properties. 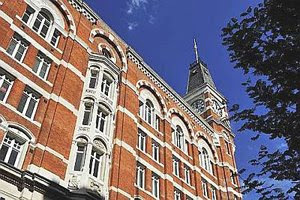 The apartments are priced between £345,000 for a one-bedroom 500-sq-ft unit to £1.8mil for a three-bedroom 1,850-sq-ft unit. There are also 1,150-sq-ft duplexes with two bedrooms priced at £850,000. The properties, which are gated, come with concierge and night porter services, landscaped water gardens, courtyards and underground car parking bays. The Times Square buildings, comprising 205 apartments, and the 45-unit Hoopers Yard building are completed. The Sugar House is a 19th century Victorian building currently being refurbished by Berkeley Homes. The 42-unit Sugar House is a 19th century Victorian building that is being refurbished for completion in August. “The Sugar House will have high ceilings and a grand entrance staircase,” Clanford says. Berkeley Homes will be at the G-Hotel in George Town to promote City Quarters today and tomorrow. MALAYSIA'S property outlook sentiment has deteriorated further, according to a survey carried out by a local property website. The thinkproperty.my Property Outlook Index remains firmly in the negative, currently at -51 per cent, the lowest it has been since the survey began in May 2008. "This is not positive news, but we believe Malaysia is weathering the storm better than neighbouring countries," said Asim Qureshi, chief executive officer of Think Media Sdn Bhd, which owns thinkproperty.my, in a statement yesterday. "But with unemployment rising and Malaysia's trading partners suffering from an economic slowdown, we believe the index will possibly fall further before it rises again," he added. The survey also found that with interest rates declining, people have become less keen on fixed deposit investments. "Most investors would look for alternative investment opportunities to fixed deposits, given that fixed deposits yield around 2 per cent to 2.5 per cent," said Qureshi. Thus the perception of property as the most favoured investment type has remained steady over the course of February, despite the overall fall in confidence. Within the property sector, the survey showed that there has been a continued shift in preference to landed property. Thirty per cent of respondents favoured link houses in February. Qureshi said landed properties are generally considered a safe-haven during economic downturns. The retail and office sub-sectors, meanwhile, are less favoured than they were a few months ago, with 8 per cent of survey respondents favouring both sectors compared with 21 per cent in June 2008. The survey, an on-going one since May 2008, polled nearly 1,500 people through the thinkproperty.my website. The survey asked respondents their opinion on the outlook for the Malaysian property market over the next 12 months. The index takes the number of respondents that believe prices would rise, subtracts the number of participants that believe prices would fall, and then divides this figure by the total number of participants, and calculates this on a rolling 30-day basis. PUTERI Hotels Sdn Bhd, a subsidiary of Johor Corp, is making an entry into the hospitality market in Saudi Arabia, through a joint venture with Arab Resort Areas Co (Arac). 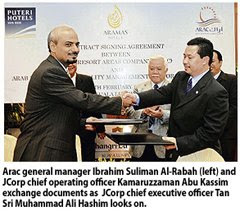 It formed a joint-venture company called Arab-Malaysian Hospitality Management (AMHMC) with Arac on May 3 last year, to build and manage a chain of hotels and resorts under the Aramas Hotels and Aramas Resorts brand. In a statement issued recently, Puteri Hotels said the first hotel will open its doors in Madinah in September. To be named Aramas Hotel Madinah, it will be unique because of the cultural hospitality products and Islamic values adapted to the service, food and accommodation. Puteri Hotels said Muslims now formed about a fifth of the world population and this number is projected to reach 2 billion by 2010. As such, it believes that a hotel and resort chain imbued with the halal concept and other Islamic values will be well-received. Being syariah-compliant, the hotels will be run strictly on Islamic principles, serving alcohol-free drinks and halal foods, and without the usual discotheques, nightclubs and bars. Puteri Hotels said it aims to develop ultra-comfortable and fully-facilitated guest rooms, with high-definition in-room entertainment, featuring a broad range of television channels and movies. Arac is a subsidiary of Taiba Investment and Real Estate Development Co, which currently owns and operates various upmarket properties in Saudi Arabia, including the Taiba Residential Suites, the Arac Yanbu Resort and the Arac Hotel Al-Ula. GEORGE TOWN: Kuala Lumpur Metro Group, developer of water chalets and water homes in Port Dickson and Malacca, is planning to develop a RM200-million water homes resort project in Teluk Kumbar on Penang island. KL Metro Group managing director Datuk Low Tak Fatt said on March 6 the project, comprising 326 water chalets and sky pool villas, was scheduled to start by year-end and to be completed in 2012. KL Metro said the project would be self financed and have three designs while the land area would range from 800 sq ft to 1200 sq ft. Prices start from RM500 to RM600 per sq ft. The 80 water chalets would have a jacuzzi on the balcony, 166 water chalets a private pool and another 80 sky pool villas (multistorey) would each have a private pool. "We are hoping to sell 75% of the units, which wouldl be leased back to us. The rest of the units will be run as a resort with five-star facilities," Low said at a press conference. Low said all the units would be furnished and KL Metro targeted 80% to 90% of the buyers to be foreigners. "So far, we have attracted buyers from over 27 countries," he said. Out of the total area of the project, 18 acres would be above water while only two acres will be on land. Chief Minister Lim Guan Eng, who was at the press conference, said the state government will fast track the approvals for the project. "This project will benefit the tourism sector and we will ensure that all conditions and specifications are met by the developer before approvals are given," Lim added. The project involves sea reclamation of 2.5 acres to build the club house, swimming pools, podium car park and other facilities. KL Metro Group won CNBC's international property award (2007) in London for the current project, Legend International Water Homes under the category "best architecture and best development". Touted to be the largest water chalet developer in the country, the developer completed 392 units of water chalets and service suites, now managed by The Legend Group of Hotels and Resorts. Phase Two of the project, the Legend International water Homes is expected to be completed by May this year. Listed cement companies appear to be doing well based on their latest quarterly results but analysts and industry association agree that it could be quite a different scenario this year. Cement producers, like its construction peers, are counting on the Government stimulus packages to provide growth. There is also the issue of rising costs for the industry. The demand for cement is expected to drop this year as the construction sector slows down. While there is hope that quick project implementation could help boost the industry in the second-half year, analysts and the industry association, however, expect demand to likely rise only in early 2010. Cement and Concrete Association of Malaysia executive director Grace Okuda says the 5% electricity tariff reduction effective March 1 will not be enough to reduce the cost of production for the industry. Cement producers are still absorbing the 26% electricity tariff hike announced in August last year, Okuda says. “The industry was hard hit by the hike as it is a major user of energy and a 5% reduction is not much compared with the previous hike,” she says. However, if the implementations of the Government’s stimulus packages are quick, it could help boost cement demand for the year, she says. Okuda also confirms that construction activity has slowed down. An analyst with a bank-backed brokerage says her firm has a “trading buy” on the construction and related sectors, in the hope of a higher amount from the mini-budget stimulus package to be announced on March 10. Cement makers such as LaFarge Malayan Cement Bhd are waiting for the Government package despite the fact that it exports 30% of production. “But the RM7bil stimulus package announced earlier is not enough to help the construction sector and thus, the cement manufacturers,” she says. The next package will have to be bigger to boost demand for cement, the analyst adds. AmResearch analyst Mak Hoy Ken says even with the fiscal pump-priming, there will be an “implementation lag”. “A boost in demand will be seen by the first month of next year,” he says. Mak points out that unlike steel, cement prices has only recently (in the past six months) shot up, which further put a dampener on demand. Following the liberalisation of the sector on June 5 last year, there have been two rounds of price hikes for cement by 15% to 20% in June and about 8% in August the same year due to an unprecedented 63% hike in diesel price and 26% rise in electricity tariffs respectively. 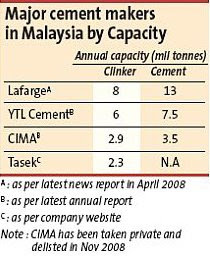 Cement price currently stands at about RM275 per tonne from RM220 in early 2007. However, rebates are often given to customers for the sale of cement, so the real price is hard to determine, Mak adds. The country’s largest cement manufacturer, LaFarge Malayan Cement, reported a 79.5% jump in pre-tax profit to RM129.4mil for its fourth quarter ended Dec 31 compared with the previous corresponding period. The company, in its Feb 18 announcement, said the huge gain was mainly attributable to higher revenue, lower maintenance costs due to the timing of scheduled plant shutdown as well as the non-recurring gain on the sale of certified emission reductions of RM29.6mil. Smaller but also main board-listed Tasek Corp Bhd did not report year-on-year quarterly performance due to a change in financial year-end but posted a pre-tax profit of RM28.3mil for the fourth quarter ended Dec 31 on a revenue of RM143.2mil. Tasek recorded a slight rise of 0.2% in revenue to RM143.25mil in the fourth quarter compared with RM142.96mil in the preceeding quarter. 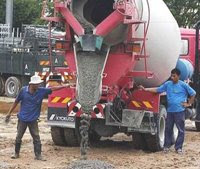 However, pre-tax profit fell to RM28.3mil against RM34.1mil in the third quarter, “affected by lower demand for local cement and higher operating costs,” the company said in its Feb 23 announcement. YTL Cement Bhd, a major local cement producer which analysts estimated as being larger than Tasek but smaller than LaFarge, posted 11.3% growth in pre-tax profit to RM69.9mil and 55.9% jump in revenue to RM492mil for its second quarter ended Dec 31 compared with a year ago. “The increase in revenue and pre-tax profit were substantially attributed to overseas operations and better selling prices,” it said.